Since Monday is an important day to feel inspired, I want to share this gorgeous "real life home" tour with you today. I simply cannot wait another moment to do so! 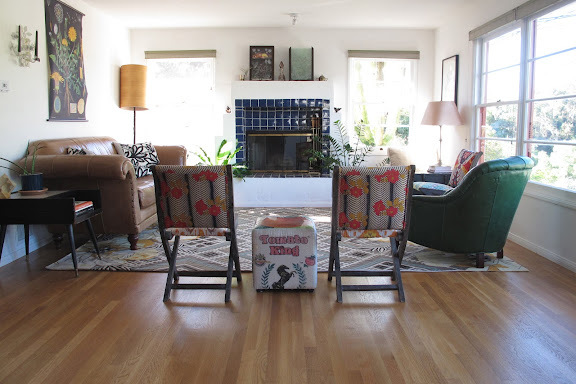 I discovered Annalise Neil's beautiful, San Diego home via the lovely Jora of Domestic Reflections--one of my favorite blogs. And thank goodness I did, because Annie's eclectic home exudes so much love, warmth and depth, that it simply cannot be contained. This 1946 bungalow, affectionately referred to as "Neilhaus", is situated on a quiet, dead-end street above a tiny canyon that is home to gray foxes, possums and other small wildlife. Marking the beautiful home are two, wind-swept juniper trees, which you can see a portion of above. It truly sounds like an ideal location to raise a family, which is just what this printmaker and freelance writer is doing! In fact, as your eyes move through this home tour, be sure to keep your eyes peeled for Annalise’s original etchings, prints, copper plates and drawings dotting the photographs (which were also snapped by Annie). 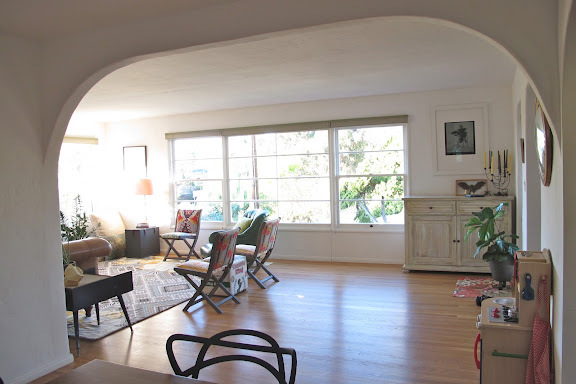 Her light-filled living room, populated by what Annalise refers to as a “motley assortment of vintage mid-mod, militaria and scores from Anthropologie sample sales” is the room that first caught my eye. 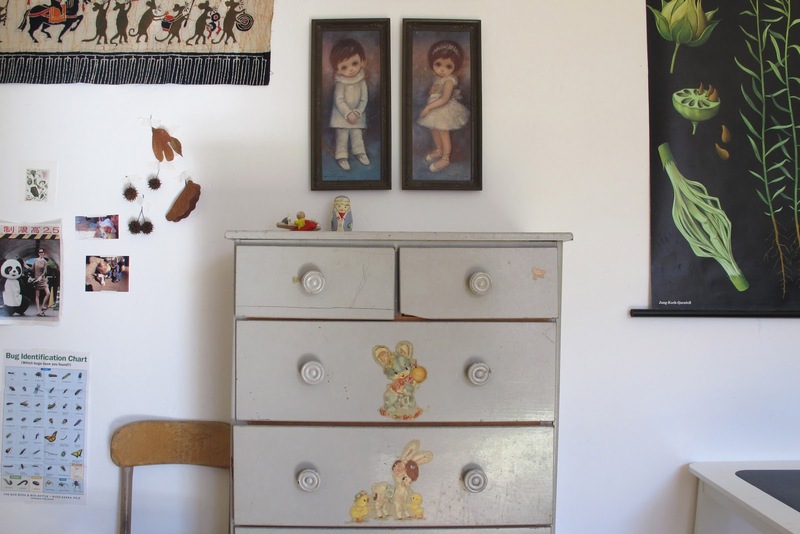 Having moved around several times, Annie’s home is the perfect example of bringing together little treasures from both near and far. And, as someone who prefers large, open windows sans treatments, I really appreciate the open feeling these windows create. 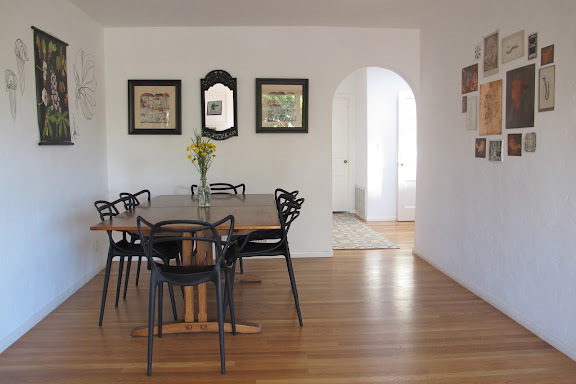 Like me, Annie procured her antique dining table on Craigslist—a fabulous source if you prefer a mix `n’ match look. Isn’t it well-paired with those dramatic, but minimal chairs? And the perfectly arranged wall of art? I love the idea of enjoying a simple meal with friends around this table. It’s such an inspiring setting. 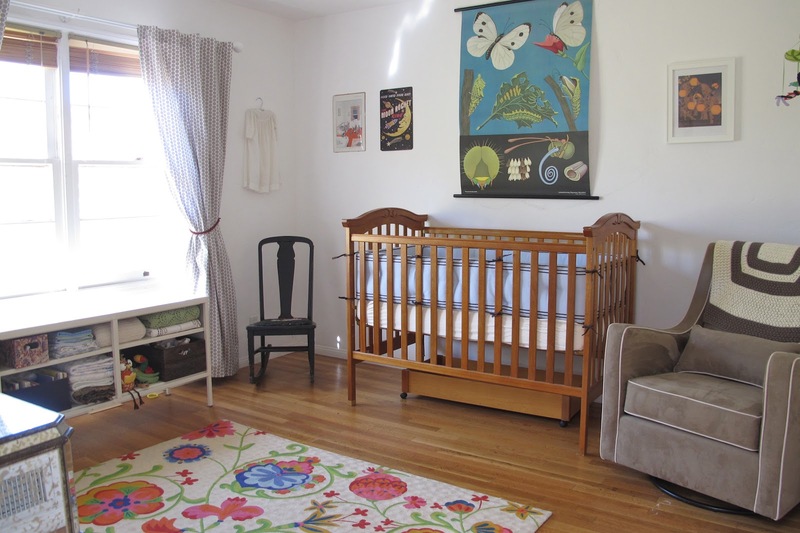 The nursery at Neilhaus is home to Annie’s little 8-month-old, Baby O. 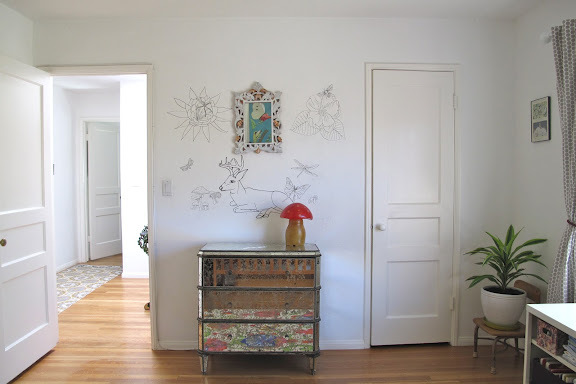 The walls are adorned with vintage ephemera, including a favorite print by Arthur Rackham. Annalise was lucky enough to discover this “Alice in Wonderland” print when helping her mother clean out a closet. A few other special details in the nursery include the crewelwork bouquet on the rocking chair, the blessing gown from Annie’s favorite antique store in Philadelphia, and the woodland imagery she created over the mirrored chest of drawers (also an Anthro sample). 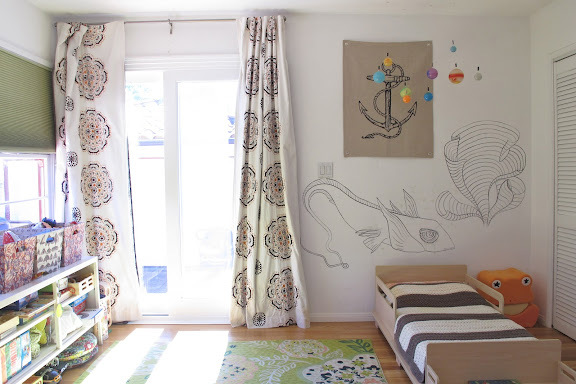 Her 3-year-old son’s room is an ideal space for a toddler, but is decorated in a way that will easily transition her little man into a “big boy”, with just a few minor changes. 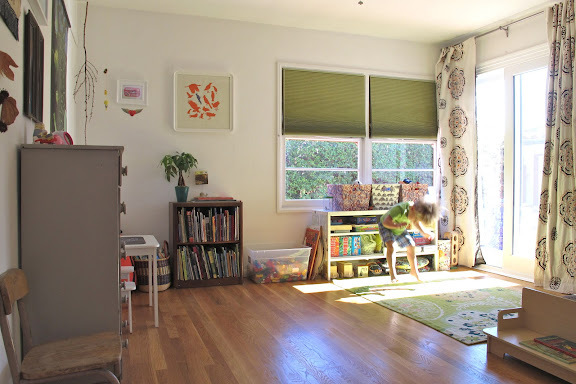 I love the room to grow in this space! When crafting a space for a child, there is such a temptation to buy everything new, (I know because I’ve been there before!). But what I appreciate most about Annalise’s style is that she creates character by mixing antiques in with new pieces. Special antiques in this room include the chest of drawers from “a perfectly cluttered” thrift store in upstate New York and a vintage sardine advert found down the road. She purchased the mouse tapestry in China many years ago with the intention of hanging it in a future child’s room. I love that. 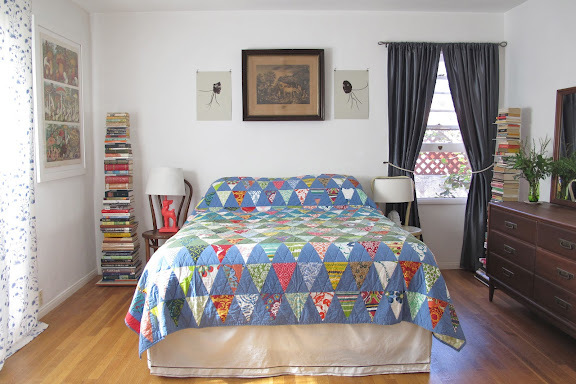 The last bedroom to be featured in this particular home tour is that of Annalise and her husband. 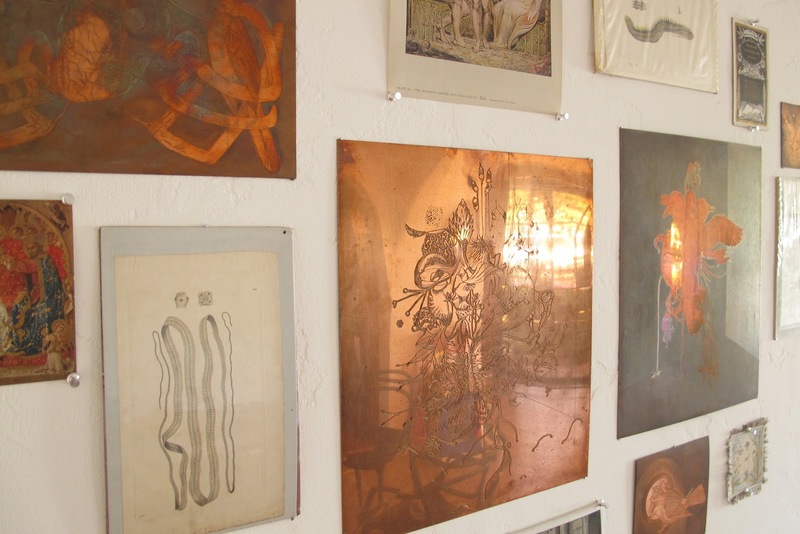 Hanging front and center is an old lithograph they discovered together in the basement of their old row house in Philadelphia years ago (such a great story!). Flanking the antique lithograph are two of Annie’s own lithographs—one of her husband and one of herself. I am also impressed by the clever display of books in their bedroom. Is anyone else amazed at how surprisingly monumental it is to come up with the best way to display a personal book collection? It sounds so simple, but it often proves to be a vexing design issue I find. Annalise seems to make it look effortless here. Bougainvillea beckons guests through the door to the small dwelling out back. Slated to be Annalise’s future studio, it currently serves as a guest home for visiting family and friends. 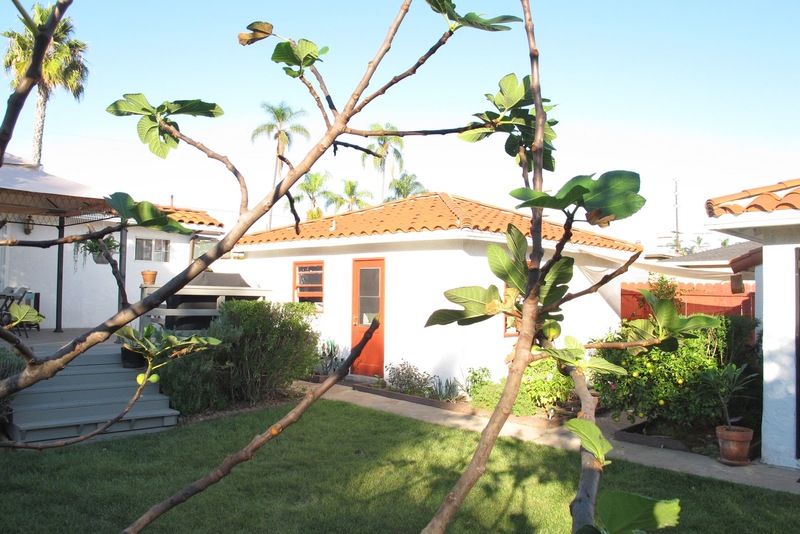 The beautiful backyard is not only home to the small animals that venture out of the canyon, but to persimmon, pomegranate, peach, lemon and fig trees. Sounds pretty heavenly, doesn’t it? 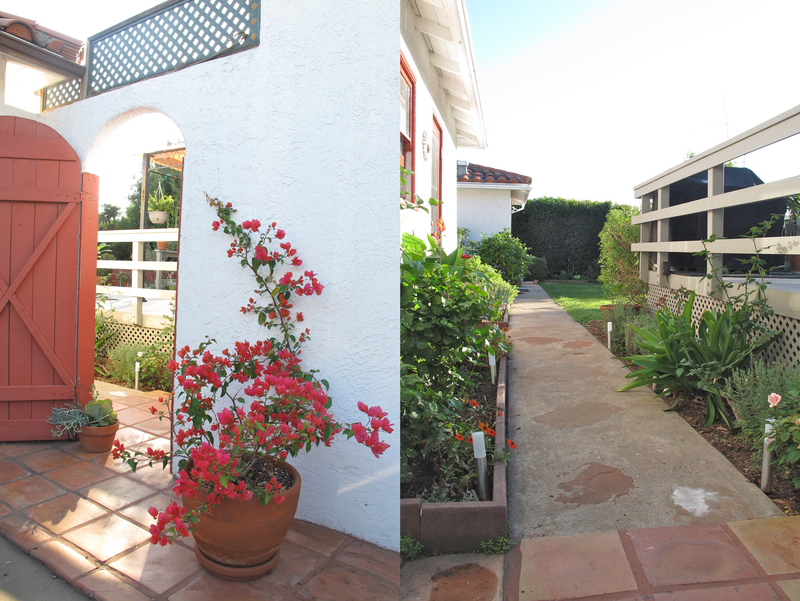 If you'd like to peek at some more "real life homes", enjoy these previous posts. Annalise, thank you for sharing your beautiful home with us! thanks steph. this home is so lovely. i am so glad you are still doing this series. my favorite elements include that bunting quilt, the amazing curb appeal (LOVE), the arches, the art, and the overall simple/ecelectic/vintage vibe. what special digs. annalise strikes the perfect balance of sophistication and reality. loving it. The light in this home! No artificial "happy light" needed here. Love the white walls (I've since painted all mine white since you featured my house!) and the original art everywhere. I could go on a treasure hunt through the house looking at all of it. Curb appeal is amazing. I want. Every single picture is so inspiring!! I love, love, love how artistic this home is. I feel like I would love to get to know the interesting people who live here. So beautiful! Beautiful. 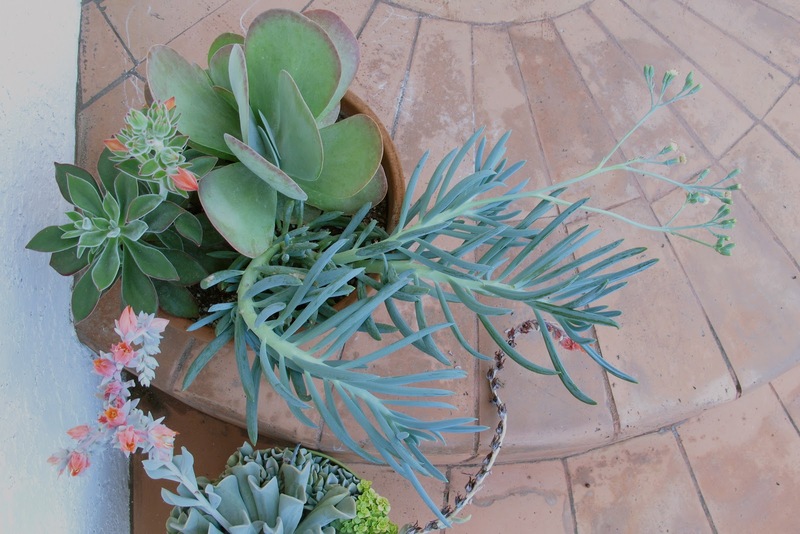 I love that the plant bed in front echoes the splashes of blue-green in the interior. (Or vice-versa.) I'll echo the love of the white walls and open spaces. I painted all of our walls white, too!Those vintage bungalows are such wonderful homes. Too bad that the modern 'flash' house developments don't present as much quality and character! Beautiful home and art. Absolutely beautiful. Effortlessly cool and chic but still comfortable and livable. I love Californian style. those kids rooms are perrrfect. 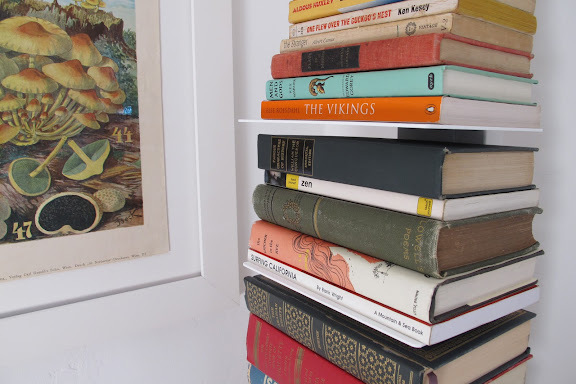 i love the stacked books in the other bedroom too. and can i just say i recently found your blog and have FALLEN IN LOVE with it? so, thanks. Thanks Steph, for doing this series. I spet an obscene amount of time today going through past posts. I love, love, love this series. Keep it up! Annalise's house is gorgeous. 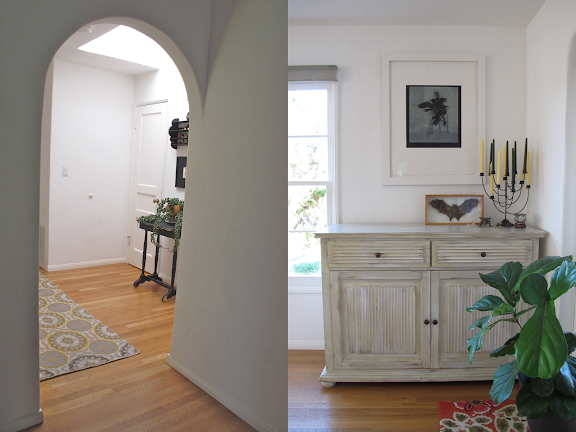 She has great style and I especially love the archways in the house. 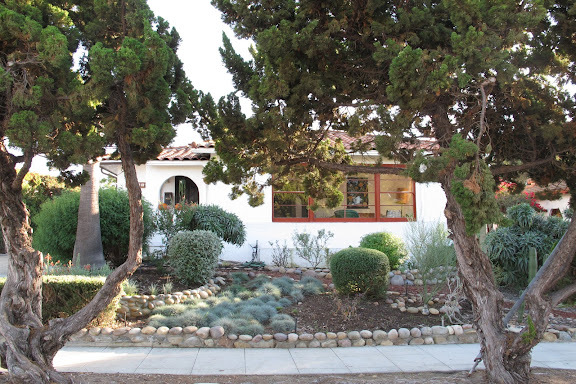 I have a friend who is slightly dismayed to be moving to Southern California in a few weeks, and I'm going to send her this link so she can see how sweet and peaceful and beautiful it can be!! wow, this is so real and honest and truly gorgeous. Thank you for featuring it. Inspiring. I've always been a big fan of the stacked book table. Lovin' the house ...... I would give anything to be in California right now. Hi. I know this was written a while ago but I am just reading it. I would love to find out about the curtains in the three-year old's room.